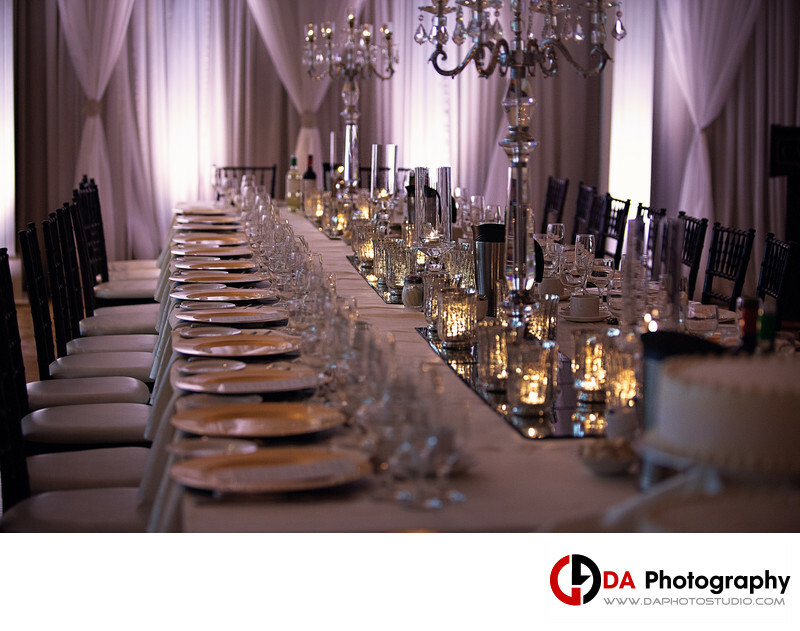 This image features a head table set up at Carmen’s banquet hall, regularly voted as the best Hamilton reception venue. The set up conveys an event space that is classy, elegant, beautifully dressed and high end. The clean lines, colour coordinated décor and uniform look lead to refined looking backdrops. This photograph is actually going to be featured as part of the Carmen’s promotional marketing material. Being a contender of the best Hamilton reception venue, they needed to make sure that there were images showcasing its beauty. We live in such a fast paced and tech savvy era, that the first place potential clients will look to compare venues is online. They will be drawn to the images and do their first round of rejections visually before making up their list of possible contenders. Clients want to see versatility and viable looks including that of different backdrops, table configurations and themes. I felt it was important to display the amazing amount of light that is available through the oversized windows which is why I decided to feature them in the background. They chose floor to ceiling length window coverings comprised of simple yet sophisticated looking drapes. The tie backs enhance the look and make for interesting lines as a backdrop. The chandeliers and candles add a soft romantic tone as centrepieces without dominating the look. Event venues are a dime a dozen yet Carmen’s have found that special balance to stand out from the competition. Location: 1520 Stone Church Rd E, Hamilton, ON L8W 3P9, Canada.